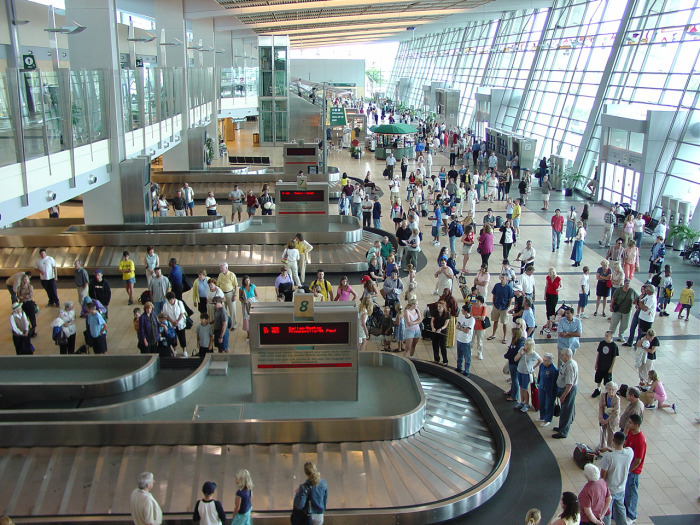 Passengers crowd baggage claim at Terminal 2. Photo courtesy San Diego International Airport. A possibly confused or irrational airline customer’s troubling comments about his luggage prompted an evacuation Wednesday of part of Lindbergh Field until authorities determined that the statements indicated no threat of any kind. A person flagged down a security officer in a baggage-claim area in Terminal 2 at the bayside airport shortly after 11 a.m. to report the man’s suspicious remarks, said San Diego Harbor Police Sgt. Victor Banuelos. Officials cleared travelers and employees out of the eastern side of the terminal while officers with a service dog and explosives experts scrutinized the luggage in question. Nothing hazardous was found, and the area was reopened shortly before noon, the sergeant said. The owner of the searched baggage, whose name was not released, was detained for a mental-health evaluation. Though any delays in outgoing flights caused by the incident were expected to be minor, authorities advised customers to double-check flight times before heading to the airport Wednesday afternoon. Banuelos declined to disclose the nature of the comments that prompted the roughly 45-minute security alert.